Where do Americans live and shop in Paris ? A funky, cozy bookstore which has been around, it would seem, forever, in the shadow of the great Notre Dame cathedral. With the spirits of Sylvia Beach, Hemingway, James Joyce, Fitzgerald, Ezra Pound and many others. Read Sylvia Beach's memoirs. THE Paris Department store ! Packs and sends your purchases for a reasonable charge ! Au Bon Marché 22 rue de Sèvres, 75007 Paris This left bank department store was the first in Paris. It has been entirely remodeled and is "très chic". Don't miss the "épicerie" for a palpitating visit through the world of French food and food from many other countries. Au Printemps 64, Blvd. Haussmann, 75009 Paris Right next to the Galeries Lafayette, the Printemps has undergone extensive remodeling. Brand name fashion. 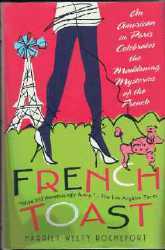 Stories on travel, beauty, shopping, food and wine and more from France to the Rocky Mountains... and "The Riches of Paris" and "The Riches of France" by Maribeth Clemente, St. Martin's Press, New York are ideal for intelligent shopping ! DID YOU KNOW THAT....? 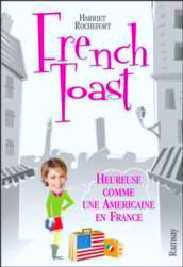 More than 80,000 copies of French Toast, published by St Martin's Press, have been sold to date! You can find it in all major Paris bookstores ! 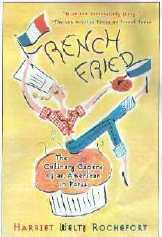 Read also French Fried, about the French and their food and French Toast adapted in French. The price is in the Euro 25 to 40 range for wash+blow dry. They are usually listed in the window. Do not forget to tip (Euro 5 minimum). Learn a few words : coupe (cut), frange (bangs), effilé (razor-cut), brushing (blow dry), teinte (color), permanente (permanent), shampoing (wash), teindre les racines (root touchup), etc. If you want to save money, use one of the hairdressing schools. USEFUL TIPS... More and more French people speak English but do not think that it is normal for them to be addressed in English, which is not their language ! They will appreciate your efforts to say a few words in French before you switch to English. Learn how to say : "Sorry : I do not speak French" which is "Excusez-moi: Je ne parle pas Français". Paradoxically, though, you may try out your French only to be answered in English! Don't give up! Thanksgiving 14 rue Charles V and 20 rue Saint Paul American groceries and your Thanksgiving turkey with all the trimmings! Home -sick ? Click here for "just-like-home places" in Paris !